I’ll admit I didn’t see the gains in Under Armour (NYSE:UA, NYSE:UAA) stock coming. Under Armour stock has been one of the best performers in the market this year. Before a recent pullback, UAA stock had risen near-60% this year — the fifth-best performance in the S&P 500, narrowly behind fellow turnaround play Chipotle Mexican Grill (NYSE:CMG). To be honest, it’s not clear that Under Armour’s performance necessarily justifies the gains. The company has had a good year, admittedly. UAA stock soared after third-quarter earnings, when the company raised full-year profit guidance. Q2 results drove the stock higher as well. That said, 2018 hardly has been spectacular. It certainly doesn’t look strong enough to drive a 50%-plus rise in Under Armour stock. Rather, investors increasingly are pricing in success with the company’s turnaround efforts. Yet the company itself is advising caution — which creates a significant risk for UAA stock. On Wednesday, analysts at Atlantic Equities downgraded UAA stock to “underweight” from “neutral,” sending Under Armour shares down 2% in pre-market trading. So, 2018 results are better than originally expected — but not by much. After Q4 results in February, the company guided for “low-single-digit” growth in revenue, a 50-basis-point expansion in gross margin and operating income of $130-$160 million. Three quarters later, revenue expectations are modestly higher, with the company projecting a 3%-4% increase for the full year. But gross margin now is projected to “improve slightly,” worse than previously thought. Operating income guidance has risen — but largely due to spending cuts, with the range moving from an initial $130-$160 million to a current $150-$165 million. Overall, the worries that drove UAA to a four-year-low last year hardly seem assuaged. The company still expects sales in North America to decline. Gross margin disappointment looks like another sign of the company’s weak pricing power, a concern I’ve highlighted in the past. The operating expense cuts are coming to an end next year, per management, and won’t contribute much, if at all, to earnings come 2020. So the gains in Under Armour stock seem driven not necessarily by recent performance, but by increased optimism toward the company’s future. And, admittedly, there is one key fundamental reason for that optimism. There’s one important metric that shows the potential – and possibly the danger – of UAA stock. Under Armour’s 2018 guidance suggests operating margins of just over 3%. adidas AG (OTCMKTS:ADDYY) is guiding for roughly 10.8%. EBIT margins at Nike (NYSE:NKE) were over 12% in its fiscal 2018 (ending May), and are expected to improve in its FY19. The easiest way for Under Armour to grow earnings is to expand those margins. And the good news is that because those margins are thin, it doesn’t take that much to drive margins notably higher. For Nike, a 100 bps improvement in margins boosts profits about 8%, all else equal. The same improvement at Under Armour on its own sends earnings up 30% or potentially more. Simply cutting SG&A spending can be a big benefit to Under Armour earnings. Many of those cuts already have been made — but the benefit won’t be seen on a full-year basis. Investors can see the impact in 2019 estimates: the Street is projecting just 5% revenue growth, but a 55% increase in earnings per share. And considering that Under Armour has so much room to get toward the 10%-plus levels of peers, profit can rise at a torrid pace for years — even without a substantial acceleration in revenue growth. What’s Priced Into Under Armour Stock? The problem, however, is that an awful lot of success looks priced into Under Armour stock already. Assume that Under Armour can get its margins to the level of Adidas: 10.8%. 2019 revenue of ~$5.5 billion suggests operating income just under $600 million. Assuming interest and other expense ($50 million) and the tax rate (25-27% excluding a one-time benefit this year) hold steady, EPS would get to about $0.90. Move Under Armour to Nike’s FY19 EBIT margins near 13%, using the same math, and EPS rises to about $1.10. In other words, if Under Armour were as strong as Adidas right now (it’s not), UAA stock would trade at about 25x earnings. If it were as strong as Nike (it’s definitely not), Under Armour stock would trade at 20x earnings. Neither multiple seems particularly attractive for ~5% revenue growth – and Under Armour isn’t close to those margin levels. Another way to look at it is that EPS in the $1 range is a nice multi-year goal for Under Armour, backed by years of significant margin expansion and solid revenue growth. But it’s likely a target not to be reached until 2022 at the absolute earliest. That problem hit UAA stock hard on Wednesday after its Analyst Day. The company itself is targeting low double-digit EBIT margins – near Nike and Adidas – by 2023. Investors should have been aware of that – yet Under Armour stock sold off by nearly 10%. Even with the recent declines, something close to perfection looks priced in. UAA stock trades at least at a mid-double-digit multiple to the company’s 2023 targets, which imply 2023 EPS in the $1 range. There’s no room in the valuation for margin expansion to slow once SG&A cuts are lapped in 2020. There’s zero room for any sort of macro slowdown in the U.S. Nor is there any accounting for further missteps from a company that has seen significant management turnover and lost two more key executives on Monday. Barring a big acceleration in revenue growth, Under Armour stock is pricing in close to complete success with the turnaround. And that seems dangerous. Success isn’t guaranteed, and most of it still is priced in. 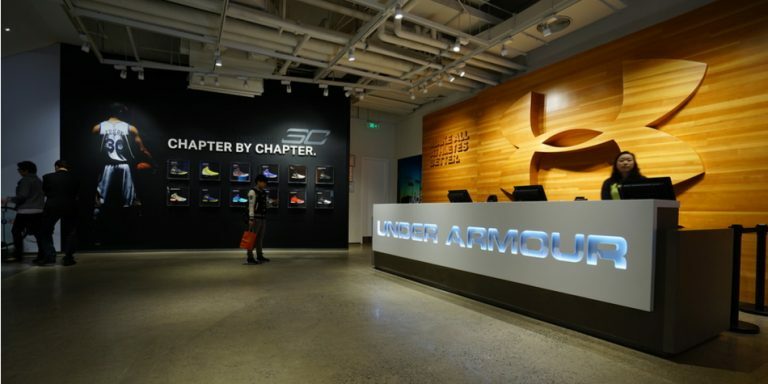 Article printed from InvestorPlace Media, https://investorplace.com/2018/12/its-time-to-be-afraid-of-under-armour-uaa-stock/.